How to Write an Impressive Resume Objective? The first thing that the employer reads is the resume of the applicant. What objectives any applicant writes in the resume really makes a lot of difference. Objectives written in the resume should engage the employer to read the entire resume. So all the applicants should pay great attention to what objectives they write. A resume should be such that it not only engages the reader, but also makes the applicant stand out from the rest. So, here is the list of the few things which needs to be kept in mind while you are preparing the resume objective. What you are looking should be the objective of your resume, but write in the manner that your employer can also identify his own objective. Looking out for a job that satisfies all your needs is a tough job. To create a resume is even more difficult, so you should try and highlight those points which your employer is looking for. Always make it a point to never use same objective for every job that you are applying for. Sometimes you may state your objectives in a way that you may stand out from the crowd, but you may not fulfill what the employer is looking for. An applicant always wants that their resume should always stand out from others, but it should be as such that the objectives of the company are also fulfilled. Say, if you are applying for the job of a salesperson and resume shows that you are suitable for the financial field, then it will be beneficial for the company, but not you. So be careful while looking for the job and filling in the resume objective. Many applicants try and focus on what they want from the job they are applying for. Like, they may talk about the perks this position offers or the retirement policy of the company or the other benefits the company is offering to their employees. In such a situation the employer gets the wrong picture of the applicant. It creates a situation that shows that an applicant is more concerned about himself and will be less concerned about the company, which is not good. So, your resume objective should be such that it always shows that you are the one, the employer is looking for. Generally, the resume which the applicant submits is not clear to show their qualification or their experience. In such a case the applicant will be left with no job. The resume objective should clearly show the qualifications and skill of the applicant. It should clearly state how it is beneficial to the company. Also, the applicant before submitting the resume should see that his skills are best suited for the job the employer has to offer. A resume objective statement should be short and straight to the point without much confusion for the employer. An employer has to go through so many job applications while recruiting for the job, so if your resume objective is that of an essay type then it might get rejected in the first place. Short and precise sentences are always preferred. The word limit generally should not exceed 30-40 sentences. So, the resume objective should be short and straight. What adjectives you use in the resume objectives can make a lot of difference. Suppose any applicant in his resume states that he is the most efficient, hardworking, sort after an employee, the employer is looking for then he is just becoming the part of the crowd. Adjectives used in the resume should be like that it strikes the mind of the employer at once. An adjective mistake that you have made in the past might have resulted in your loss of job earlier. If the applicant is posting his resume on social networking sites, then it is better suggested that he should not use resume objective. Sometimes the applicant wishes to seek a job in the company at any level because the company shows him great career prospects and if, he uses resume objective then it might get difficult for him. These days companies are selecting their candidates randomly online on the basis of the resume posted. If an applicant specifies his resume then he can be approached for a limited number of jobs. So an applicant should always try and highlight his strengths and the way he can be beneficial for the company. The resume objective should be such that it can be made applicable to a large number of similar types of jobs. While the applicant is applying for the job, then he should make it a point to do a detailed study of the company in which he is applying. The applicant should be familiar with the terms and conditions of the company. Also, he should know what are the future growth prospects of the company to which he can correlate. Always try and make it a point to use those words that shows the employer that you understand the needs of the company. Use the word objective in the resume to the left-hand side. The applicant should write his name on the top, then he should specify his contact details along with residential information. Also, the word objective should be highlighted along with the use of bold fonts. Avoid the use of the term “I” in the beginning of the objective. To some employer, its usage might denote that the applicant might be a self-centred individual. The beginning of the objective should be done with the words that show your interest in the company. This pattern of writing the resume will ensure the employer that the applicant is interested in the growth and development of the company. The applicant should not overburden his resume objective with all his qualifications. The applicant should understand the needs and the requirements of the job and state his qualifications accordingly. This will make it easier for the employee to shortlist the candidates for the job. An employer has to go through a lot of applications while selecting a candidate. If the qualifications of the candidate are neatly listed, then the chances of his selection are increased. The applicant should cross check his resume objective before submitting it in the company. He should check for the grammatical errors and also, the spelling mistakes. Such mistakes in the resume will present a wrong impression before the employer. As it is always said that the first impression has a great impact so, if the first impression goes wrong, then it will have a long term goodwill of the applicant. Adding value to the resume objective is a must. 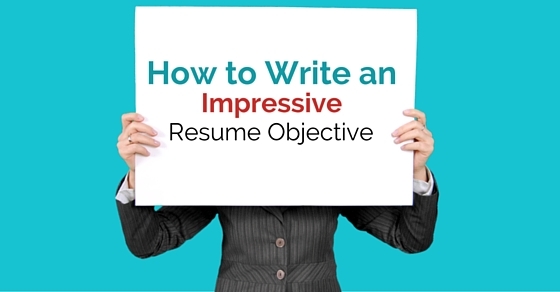 All the applicants should try to make their resume objective as interesting as possible. By interesting we mean that, the resume should be able to present the applicant’s knowledge and skill to the employer directly. For example, an objective like “my 20 years of experience as a mechanical engineer in a multinational company”, shows the applicant’s qualification, experience and working area to the employer at once. The language used for writing the resume objective should be suitable enough for the level of the job applied. Sometimes, the applicant while writing the resume objective fails to meet the standards that are set by the employer because of the language used. So, it is very important on the part of the applicant, that words that he is using should be appropriate enough. It is not always necessary to use the resume objective every time you apply for a job. Sometimes the nature of the job is as such that resume objective may defeat the aim of getting the job. If the applicant is applying for the job with no description of the job offered then it might be illogical to present the objective in the resume. A similar type of objective can’t be used for every type of job applied. It is necessary to make the changes required according to the job applied. For example, if the applicant is applying for the job of a technical head, then he can’t use the objective, he has set for the post of marketing head. Thus, it is very important to modify the resume objective when required. The career summary is also an important part of the resume objective. The employer holds the full authority to know the applicant’s career history if he wants to hire him. Knowing about the past of the applicant will be helpful for the employer to decide whether to hire or not. Also, it may be for the advantage of the applicant that makes him stand out of the rest of the crowd. So, it will be beneficial for the applicant to mention his career details because it will act to his advantage. An applicant shall never write about the areas which are not his strengths. Only the areas of strengths should be highlighted. If any applicant’s weakness is mentioned, it might create a hindrance if the applicant is getting the job. Always avoid using terms that might become the reason of not getting the job. It is not required at all to explain why the applicant has left the previous job. Knowledge about the previous work area is important, but the reason of leaving need not be explained. If the applicant has certain personalized qualities, then it can also be mentioned. These qualities should be as such that makes a difference in the resume objective. It is generally helpful for those jobs that are of an artistic nature. So, all these points should be kept in mind while writing the resume objective. An employer receives many applications when they offer a job. There are a large number of people that apply for the same job, then there should be something that sets an applicant apart from the rest. It is nothing, but the resume objective which can make a lot of difference. An employer has a very little time to denote to every resume he receives. An attractive resume will not only separate the applicant from the crowd, but also increase his chance of getting the job. Resume objective not only helps but also gives a brief knowledge about the applicant. It can ensure the employer that the applicant is well qualified, has an interest in the growth and development of the company, and also is the well-deserving from the lot. A resume objective should be such that it should hit the employer’s search at once. It act’s as the cover of the applicant’s resume and gives the employer the idea of the things the applicant has to offer. The employer can sometimes judge the applicant’s personality by the resume objective. That’s why the resume objective should be prepared wisely. It should stuck the employer to hire the applicant at once.